Sunday February 10th, classes are 3-4pm, short and optional reception immediately following. Have fun AND give the gift of summer camp! 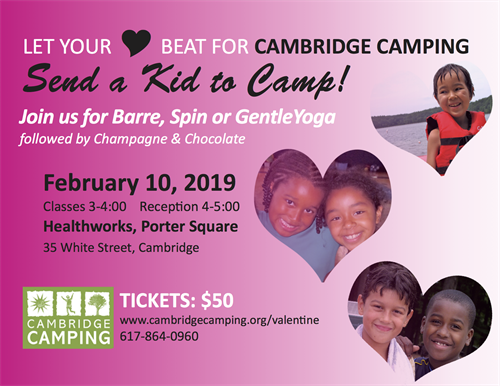 Order your tickets now for a great event that benefits the Cambridge kids from under-resourced circumstances, we serve at Cambridge Camping! Our goal is to raise $4,000 so can pay for 20 kids to go to camp for the full 5 week 2019 session. This is such a super fun and easy to participate in event. Register for a Spin, Yoga, or Barre class. No prior skills or abilities required. Men are welcome to all the classes (even thought it's a women's gym - they love having men join this event). Get a group together or come solo - kids, 12 and older, colleagues, spouses, partners, friends...and the champagne and chocolate reception is a festive way to wind down after the work out. Get yourself up off the couch on a cold Sunday afternoon and feel good! Healthworks, Porter Square, 3pm Sunday February 10th. Easy parking, you'll feel great after the work out, chocolate/champagne and chatting is a great way to relax and ease into the end of the weekend and the beginning of the week, football is over - - no excuses!